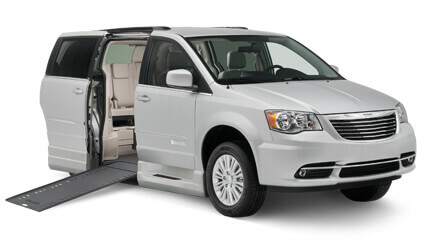 Side entry wheelchair accessible conversions offer freedom and independence without compromise. These conversions consist of a lowered floor section to allow proper height in order to accommodate a variety of wheelchair users from children to adults. Special wheelchair ramps are integrated into the conversion and come available in either power or manual versions, bi-fold or in-floor depending on the style of conversion desired. Full cut conversions provide complete flexibility in wheelchair placement, especially for wheelchair occupants that wish to drive, or travel in the front passenger position. Both vehicle front seats are easily removable via special roll out bases. Wheelchairs can also be safely secured in a central position with this configuration while leaving the removable front seats in place. Every conversion comes complete with a wheelchair restraint kit and can be upgraded with an optional wheelchair docking device. Full power options are available to provide complete automation in entry or exit of your van. The press of a button or remote can automatically open the sliding door, deploy the ramp and lower the rear suspension to decrease ramp angle. Short cut conversions are also available and are designed for passengers to ride in a central position. This style is ideal for child wheelchair occupants and those looking for more affordability in a side entry configuration. Many options are available in order to accommodate driver applications. Removable front seats offer wheelchair placement behind the wheel. A special bracket is installed on the wheelchair to engage into a floor mounted docking device. For those able to transfer, a six-way driver’s seat base can be installed that travels forward/backward, up/down and rotates under full power. Adaptive Driving Controls and devices can also be added to gain complete control and independence. Please contact Goldline Mobility today to learn more about what our mobility vans can offer you. If you are unsure of which model is best suited to your needs, simply contact our certified mobility consultants for their professional assistance. We would be happy to discuss all available options with you.